OMG, Chantal Fernando has blew my mind away with her amazing yet simple writing style that it capture all of the characters emotions! She has create another fantastic yet addicting MC book that all of the reader will love every page of it. 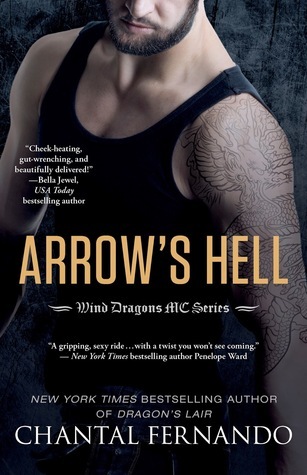 I am totally obsessed with her books already that I immediately love every chapter of Arrow's Hell except when Arrow is being a-whole. But the readers will finally get to read Arrow love journey that they will desperately waiting for. Arrow and Anna have a true love story but it will be challenging and complicated for them to have their relationship solid. Anna is a gorgeous women that she is also intelligent by getting her doctor degree in her hometown. She has finally come back home where her MC brother has been. Their relationship may be rough but the more time they spent together, the more they form closer connection. Anna is fond of her brother and his MC friends that one of them catch her eye. Anna is very attraction to Arrow however their passion will be a great challenge. Arrow is hot fine Alpha men but he is also grieve his loss over Mary that it becomes unexpected when he becomes very attracted to Anna. Arrow may be a-whole but it will take some times to figure out that they are meant for each other. They have hot and intense passion between them that it makes their romance much better! There will be some drama going on but it will more stop them from loving each other. Another great besr-seller!!!! !